The Institute for Computational Cosmology- a leading international centre for research into the origin and evolution of the Universe. The ICC addresses some of the most fundamental questions in science including: What were the first objects in the Universe? How do galaxies form? What is the nature of dark matter and dark energy? Where does the large-scale structure of the Universe come from? What is the fate of the Universe? The Institute for Particle Physics Phenomenology- a leading international centre for research in particle physics phenomenology - the bridge between theory and experiment in the study of the tiny building blocks of all matter in the universe and of the fundamental forces that operate between them. Centre for Extragalactic Astronomy- One of the largest astronomy groups in the UK and Europe, hosting world-class activities in observational extragalactic astronomy and cosmology, encompassing the formation and evolution of galaxies, clusters and large scale structure. Department of Mathematical Sciences– Durham’smathematicians are actively engaged with a wide variety of research areas, including Pure Mathematics, Mathematical Physics, Numerical Analysis, Probability and Statistics. 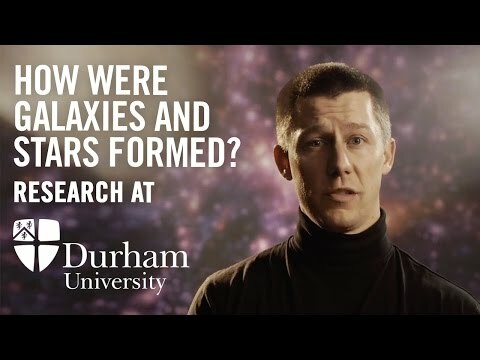 Dr Mark Swinbank discusses how his research uses observations of distant galaxies to understand how galaxies and stars formed and evolved at just a fraction of the Universe's age. The research group in Durham contains some of the world’s leading researchers in astronomy, cosmology and galaxy formations, and has access to some of the world’s leading telescope facilities. Dr Mark Swinbank is an extra-galactic astronomer in the Institute for Computational Cosmology at the Durham University. His research interests include the formation and evolution of galaxies, galaxy clusters, large scale structure and galaxies in interaction. Durham University is distinctive - a residential Collegiate University with long traditions and modern values. Durham seeks the highest distinction in research and scholarship and is committed to excellence in all aspects of research and education. Durham University is proud to be an international scholarly community, with students and staff from 156 countries.